Welcome to Marble Inspiration a family run firm based in the Cotswolds, England. 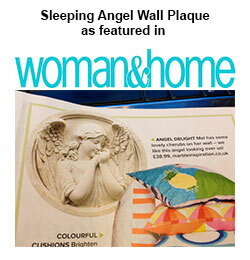 This website showcases and sells bonded marble ornaments and wall plaques, ideal for the garden and home. We have a unique collection of high quality decorative ornaments and garden art. Each piece is made with skill and craftsmanship to a very high standard. Featuring fine detailing, our ornaments and plaques are weather resistant and are made using white Spanish marble and granules bound with a cement fondue. The designs of our garden ornaments and wall plaques are inspired by magic, myths and legends. We have a beautiful and unusual range to suit all tastes. We have a stunning collection of Art Nouveau style wall ornaments. See our fun range of gargoyles perfect for a garden wall. Mythical wall plaques are perfect to create a magical atmosphere. If you’re looking to buy something a little different for a garden feature or to enhance your home decor, you should find it in our selection. Just click on a heading in the menu on the left. All garden ornaments and plaques can be purchased online and payments are very straightforward using secure pages that ensure that all your details are absolutely safe. Feel free to email us for advice or help - and we’ll get back to you as soon as possible. To browse the site simply click on a category to begin or use the product search box. "My personal congrats on the packaging of the gargoyle. It arrived PERFECT! last Friday and is awesome! I can’t believe how quickly it arrived. (I just confirmed order on Monday). Thank you again for all your troubles and also to whomever cast the show pc. I can see why you were hesitant in sending overseas, but in this case, no worries. I hope to do future business with you. So very cool! Best find yet!